Upcycling has been called the sexier, greener version of recycling. According to upcycling enthusiasts recycling aka “downcycling” is breaking a product down into something of lesser quality while “upcycling” transforms or re-invents an otherwise disposable product into something of greater value i.e. an old suitcase made into a pet bed. 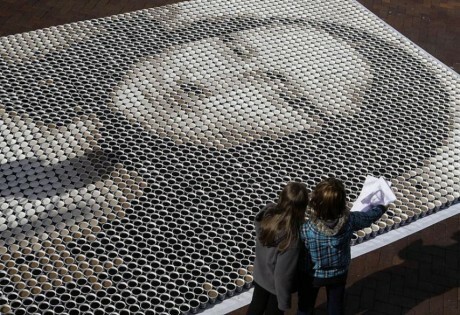 During the 2009 Rocks Aroma Coffee Festival in Sydney, Australia, a 20 x 13 foot replica of the Mona Lisa was created using 3,604 disposable coffee cups filled with varying amounts of coffee and milk, a reinterpretation of Da Vinci’s “painting” where brush strokes were the positioning of the upcycled coffee cups and paint the amount of coffee vs. milk in each cup. Other innovative uses for spent coffee include efforts by companies like Equator Coffee and Teas, of San Rafael, CA who re-use their coffee waste to grown protein rich mushrooms in developing countries. And then there are the dozens of re-purposing entrepreneurs who have launched web-based businesses upcycling all manner of things coffee including burlap sacks once used to transport green coffee beans now made into upscale pillows and tote bags. So while you’re enjoying your next latte macchiato or doppio espresso, engage your right brain and start thinking about a creative use for that disposable coffee cup or foil lined coffee bag, a product that deserves a new life as a vase or designer hat. You like soda, you like espresso. Why not combine them together? 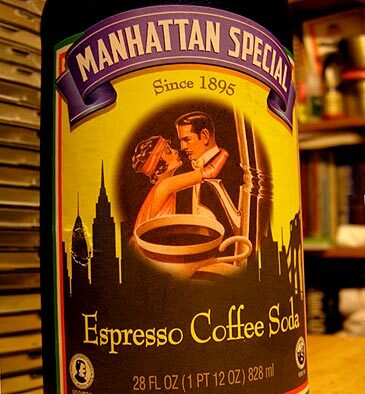 That’s what the Manhattan Special Bottling Company of Brooklyn New York decided to do when they introduced their Espresso Coffee Soda over 100 years old. Made according to a secret family recipe and labeled as the “world’s most delicious pure espresso coffee soda”, various reviews describe it as tart, sweet, with caramel bubbles and a soft fizz. As to the flavor of espresso, fans definitely say yes. As to the sweetness. Espresso being a strongly flavored coffee needs a little added sugar but with 39 grams of sugar in an 8 oz. bottle of soda it does remind me of my Italian family’s penchant for over zuccherizing their espresso . . . . Sweeeeeeeet but that’s the way they like it. Many people in Brooklyn say they grew up on this stuff and for some it may be an acquired taste like the Italian soda Chinotto made from the small, bitter citrus fruit of the myrtle-leaved orange tree which weirdly enough some people say this soda tastes like. During the Early 16th century, an Italian architect named Bernardo Buontalenti discovered a way of freezing a mixture of churned, sweetened milk and egg yolks and so the art of making gelato was born. A native of Florence, Buontalenti is said to have delighted the court of Caterina dei Medici with his creation. And with typical Italian sprezzatura ice cream becomes an art form and as such takes on a personality that requires more than a mere labeling of chocolate or vanilla. 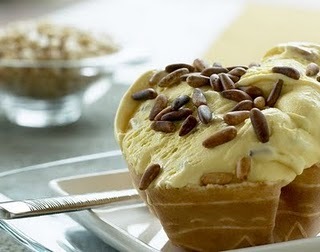 Here are some of my favorite flavors from Riva Reno Gelateria with shops in Ferrara, Milan, Turin, Rome and Florence. In an article published by the San Marco Times, a Venetian expedition to Egypt discovered a rare and exotic plant previously unknown to our shores. Paduan physician and botanist Prospero Alpini, who accompanied the expedition, was credited for bringing the knowledge of this plant, known as Coffee Arabica L, back to the Serene Republic of Venice. Alpini commented that he planned on publishing his findings in a book under the title De Medicina Egyptiorum which he believes will be the first mention by a European writer of the coffee plant. 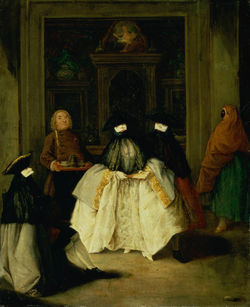 Venetian merchants are now offering coffee-drinking to the wealthy in Venice, charging them heavily for the beverage. We are petitioning the Doge and the Council of Twelve to make this drink available to all citizens although there have been reports that the Catholic Church may ban the drink saying that coffee is for Satan’s followers and Christians who drink it might lose their souls to the Evil One. Strong trade links with the Levant remain controversial yet it is unlikely that Venetian traders will sever ties with the region as long as the importing of coffee into Italy is profitable. Investors are now being approached and it is said that the first European coffee house outside of the Ottoman Empire is scheduled to open in Venice in a few years. Before the Cavern and Brian Epstein there was another Liverpool pub club and agent/adviser who provided an incubator for one of the greatest bands of all times, the Beatles. 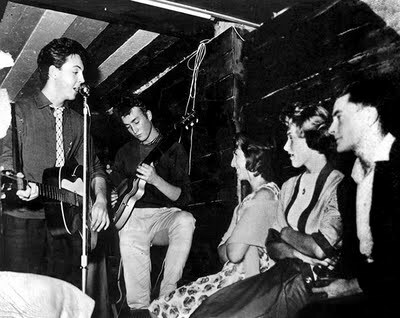 The Quarry Men as they were known then, played their first gigs at the Cabash Coffee Club owned by Mona Best, the mother of Pete Best, the group’s original drummer. Mona converted the basement of the family’s 15-room Victorian home (purchased with the proceeds of a 33-1 Derby win) into coffee bar and social club with live rock ‘n’ roll and the first espresso machine in a Liverpool club.